Bovine IgA detected in bovine serum using Mouse anti Bovine IgA (MCA2438GA) followed by Goat anti Mouse IgG:HRP (STAR77). 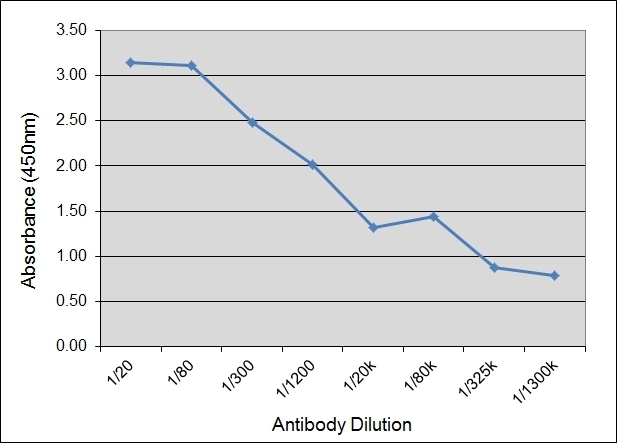 Mouse anti Bovine IgA, clone IL-A71, is specific for bovine immunoglobulin A (IgA). IgA is the predominant surface secreted immunoglobulin from the intestinal, urogenital and respiratory tracts. IgA functions in a protective capacity, primarily, by preventing viruses and bacteria from adhering to epithelial tissues. High concentrations of IgA are found in saliva, colostrum, milk, tear duct fluid, urine and nasal fluid. Clone IL-A71 is reported to immunoprecipitate bands of approximately 62kDa and 75kDa, which is consistent with the heavy chain and the secretory component of IgA (Williams et al. 1990). In addition to clone IL-A71 which is specific for bovine IgA, monoclonal antibodies recognizing the other major bovine immunoglobulin classes and sub-classes are also available from Bio-Rad. Williams, D.J. et al. (1990) Quantitation of bovine immunoglobulin isotypes and allotypes using monoclonal antibodies. Vet Immunol Immunopathol. 24 (3): 267-83.
van Dissel, J.T. et al. (2005) Bovine antibody-enriched whey to aid in the prevention of a relapse of Clostridium difficile-associated diarrhoea: preclinical and preliminary clinical data. J Med Microbiol. 54 (Pt 2): 197-205. Sridevi, N.V. et al. (2014) Development of anti-bovine IgA single chain variable fragment and its application in diagnosis of foot-and-mouth disease. Eur J Microbiol Immunol (Bp). 4 (1): 34-44. Hägglund, S. et al. (2011) Bovine respiratory syncytial virus ISCOMs-Immunity, protection and safety in young conventional calves. Mwirigi, M. et al. (2016) Capsular polysaccharide from Mycoplasma mycoides subsp. mycoides shows potential for protection against contagious bovine pleuropneumonia. Vet Immunol Immunopathol. 178: 64-9. Blodörn, K. et al. (2014) Vaccine safety and efficacy evaluation of a recombinant bovine respiratory syncytial virus (BRSV) with deletion of the SH gene and subunit vaccines based on recombinant human RSV proteins: N-nanorings, P and M2-1, in calves with maternal antibodies. PLoS One. 9 (6): e100392.